Catholic vestments include not only the chasuble “the modern cloak,” but also a number of other pieces, a stole and a maniple. Originally, the stole was a large piece of linen cloth worn over the deacon’s left shoulder. Used to purify the sacred vessels, it was later replaced by a smaller cloth called a purificator. Today, the stole serves only a symbolic function. The maniple (Roman style) originally served a similar purpose to the stole. It was used to cleanse sacred vessels, but it was also used to wipe the celebrant’s eyes and mouth. It became an ornamental piece of the vestment in the 12th century. The origins of the traditional Catholic vestment date back to the early Christians in Rome . Early Christian vestments were not unique. If fact, they were the garment of the day. The chasuble, a modern term, was a cape or cloak worn by everyday Roman citizens. In those days, the presbyters and deacons wore the same garment whether they were celebrating the Eucharist or tending to daily life. But over time, as garment styles changed, the early clergy deemed the new styles unsuitable for worship, and so they preserved the old style garments for their celebrations. 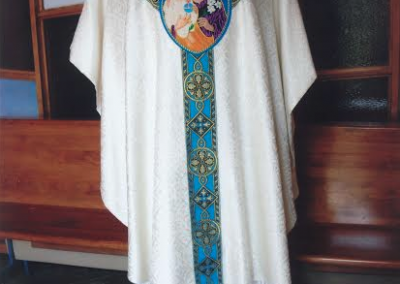 The Roman vestment of today, which was the Italian style of chasuble, dates back to the Middle Ages. The original cloak was simply a large semicircular piece of fabric that covered the whole body with only an opening for the head. St. Paul mentions his cloak in the second Epistle to Timothy (4:13) when he writes, “The cloak that I left at Troas.” The cloak of that day was worn by the poor and middle class people who were not Roman citizens, and because they were not citizens, they were not permitted to wear the Roman toga. The Gothic vestment of today dates back to the Gothic Revival period. Liturgical vestments were neither invented by the Church or imitations of the Jewish clergy. The vestments simply evolved from the early Christian garb of Roman times and acquired a sacrificial significance because the early martyrs wore cloaks during the persecution. And thus today, the vestment is meant to be a continual reminder and tribute to the sufferings that the early Christians endured. A flat, square container of cloth, the same color as the vestments, in which the corporal is carried to and from the altar. It is placed over the veil on top of the chalice. A cloth covering, of the same color as the Chasuble, that conceals the chalice and paten up to the Offertory, and after the Communion. 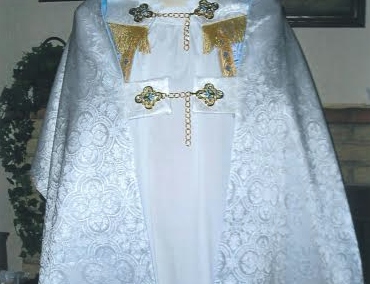 The outer vestment put on over the others. Originally this was a very full garment, shaped like a bell and reaching almost to the feet all the way round. During a bad artistic period, the 18th and 19th centuries especially, the Chasuble suffered much from a process of shortening and stiffening. 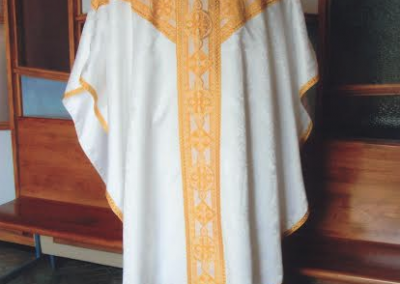 Today there is a return to the historical and beautiful, ample, nicely draping Chasubles. The Chasuble symbolizes the virtue of charity, and the yoke of unselfish service for the Lord, which the priest assumes at ordination. An outer, sleeved tunic that came to Rome from Dalmatia , whence its name. It is worn in place of the Chasuble, by the deacon and subdeacon during Solemn Mass. It symbolizes the joy and happiness that are the fruit of dedication to God. An ornamental vestment of colored silk or damask worn over the left forearm. Originally this vestment was a handkerchief carried in the left hand or thrown over the left arm. It symbolizes the labor and hardship the priest must expect in his ardent apostolate. Roman magistrates wore a long scarf when engaged in their official duties, just as our judges wear a court gown. Whenever a priest celebrates Mass or administers the Sacraments, he wears the Stole as a sign that he is occupied with an official priestly duty. When placing the Stole about his neck, in vesting for Mass, the priest begs God to give him on the last day the “garment of immortality” that was forfeited by our sinful first parents. Please click on the images to view complete photo galleries. At Custom Sewing by Peggy, each vestment (chasuble with stole, maniple, chalice veil, and burse; dalmatic with deacon’s stole; tunicle with maniple; cope with humeral veil) is made to order – each made to the customer’s satisfaction while working within that customer’s budget. How quickly an order can be sent out depends on several things. More ornate vestments or those requiring more hand stitching would understandably require more time. The cost of a vestment set depends upon the cost of materials and the amount of labor involved. A close estimate of cost can be figured before a customer gives final approval.